We offer an exciting and generous range of scholarships to support international students coming to study at CDU from around the globe. Our scholarships reward high achieving students with outstanding academic achievements and the potential to make a positive contribution. Scholarships are available to study in our undergraduate, postgraduate, research and pathway programs. have a record of academic excellence and high achievement. The tuition scholarships apply to the tuition fees for the full duration of an Undergraduate or Postgraduate coursework degree. The scholarships are exclusively available to international students on a student visa commencing a degree at CDU, and are awarded on demonstrated academic merit. The application deadline for study commencing in Semester 2, 2019 is 01 May 2019 at 11.59pm ACST. Download the Vice-Chancellor's International High Achiever's Scholarship Application Form (PDF 388KB) and submit with your application for admission to a degree program at CDU. To be eligible, applicants must have an 80-100 percentile score on application, submit two references and a statement outlining why they should be awarded a scholarship. Applicants must meet the University’s academic and English entry requirements. Applicants should not hold another scholarship from an Australian or foreign sponsorship agency. Application deadline for studies commencing Semester 2, 2019 is the 31 May 2019. To retain the scholarship in subsequent semesters, the recipient must maintain satisfactory academic progress each semester with minimum GPA of 4.5 with no fail grade in any subject. Maintain a full-time enrolment of 40 credit points each semester. Pay the remaining balance of tuition on or before the payment due date of each semester. Download the Global Excellence Award Application Form_for S219 and submit with your application for admission to a degree program at CDU. To be eligible, applicants must have an 70-100 percentile score on application and submit two references and a statement outlining why they should be awarded a scholarship. Maintain satisfactory academic progress each semester with minimum GPA of 4.5 and with no fail grade in any subject. Download the Global Leader Award Application Form_for S219 and submit with your application for admission to a degree program at CDU. To be eligible, applicants must have a 60-70 percentile score on application. Scholarships are to be awarded automatically on application for eligible students. Students must accept the scholarship and their offer of place at the University by the nominated due date to confirm their scholarship. 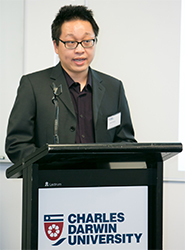 Charles Darwin University provides Undergraduate, Postgraduate and research courses for Australia Awards Scholarship students. For further information and how to apply for an Australia Awards Scholarship scholarship and support services available to Australia Awards Scholarship applicants, go to Australia Awards, or email international@cdu.edu.au. For information about scholarships, fellowships, awards and other sources of funding for study and/or research available through the Department of Education Science and Training (DEST), visit Australia Awards or email international@cdu.edu.au. This is a useful starting point for students from the US, Canada and India who are seeking financial assistance through international financial aid programs to assist with costs associated with studying at Charles Darwin University. Charles Darwin University is a 'Deferment Only' institution from 1st January 2013 and therefore no longer certifies US Federal Loans such as loans applied for under the Direct Loan Program (DLP) or the Federal Family Education Loan Program (FFELP). Charles Darwin University can approve deferments for students who have already received US Federal Student Loans. If you have in the past received a US Federal Student Loan and you are enrolled at Charles Darwin University, you can apply to defer repayment of those loans. Please contact your lender for the appropriate deferment form and submit this with your request to the US Financial Aid Officer in the Office of International Services. American Student Assistance (ASA) website - while ASA no longer provides loans to US students at Charles Darwin University, they do have a wide range of resources to help manage your loans. Global Education Management Services (GEMS) partners with highly regarded and experienced financing companies to provide the best in loan options for students from Canada and India who are pursuing their education outside of their home countries. Please be reminded that any funds you receive as part of any loan must be repaid. Understanding your rights and responsibilities are very important to know before signing up with any loan provider. There are a large number of external scholarships made available by government departments, businesses and industry groups. Information and applications are administered externally through the agency offering the scholarship and need to be sent directly to the external agency. Please note, international students may not be eligible for all the scholarships listed and the closing dates may be different to those offered by CDU. Visit Non-CDU Scholarships for more information.